﻿Yes, this is first hand news from Cibailang.com. Read it, from CBL. 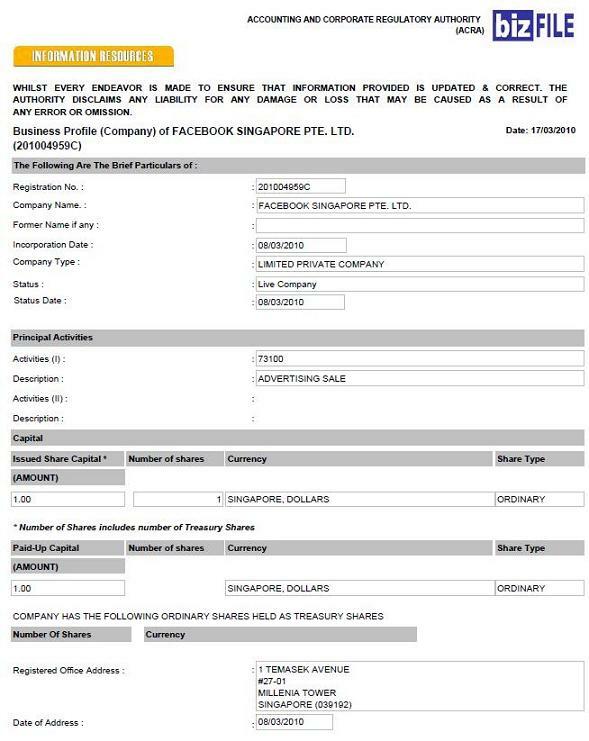 Facebook has landed in Singapore, it’s known as Facebook Singapore Pte Ltd and has office at Temasek Avenue. Date of incorporation: 8th March 2010, they earlier applied for the company name in 25th February 2010. They must be setting up their banking accounts now. Woohoo!! This is GREAT and BIG news for Singapore’s Tech World!! Enter the Social Media Giant!! There will definitely be a huge push and recognition to the online ad industry, and it’s only gonna get better and better!! as if I’m earning pots of money from Facebook…. actually i can’t sleep due to excessive consumption of caffeine. =) Facebook news was the by-product. Anyways, tks for dropping by dude.